The Silent Spirit by Margaret Coel, a Mysterious Review. Review: Margaret Coel weaves a real event, the making of the 1923 silent film The Covered Wagon, into a murder mystery spanning nearly 100 years, in The Silent Spirit, the 15th book in this series set on the Wind River Reservation in Wyoming. Kiki Wallowingbull is a troubled young man, spending nearly half of his 25 years incarcerated — juvenile detention, tribal jail, and most recently, state prison for dealing drugs. To atone for the trouble he's caused his family, he sets out for Hollywood to solve a family mystery: the disappearance of his great-grandfather, Charlie Wallowingbull, who left on a promotional tour for a film featuring "real" Indians but never returned, his whereabouts unknown and largely forgotten. But soon after Father John learns of Kiki's return to the reservation, he sets out to find him, only to discover his body in an area known where drug deals go down. The case seems closed when someone confesses to attorney Vicki Holden of killing him. But when Father John reads an old letter written by Tim McCoy, the star of The Covered Wagon, to express his concern over Charlie's disappearance, he realizes "the truth was here [on the reservation] all the time." And that Kiki's death may not be drug-related after all, but the result of something that happened in Hollywood so many years ago. 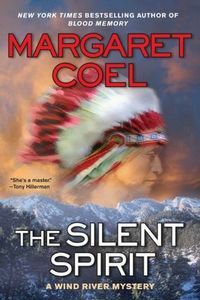 The Silent Spirit is a strongly compelling, seductive even, mystery, one that draws the reader in, knowing there's more to the disappearance of Charlie Wallowingbull and the murder of his great-grandson than meets the eye but, like the snow-covered landscape that is the setting for the story, not sure where to look to find it. The plot is clever, the misdirection subtle. The author includes several chapters set in 1922 and 1923 during the filming of, and later the promotion of, The Covered Wagon, which provide historical context to the story as well as giving clues as to circumstances surrounding the disappearance of Charlie. But it's Father John's tenacity and belief in Kiki that prevails, culminating in a denouement that will likely come as a surprise to most readers. Acknowledgment: Penguin Group provided a copy of The Silent Spirit for this review.